Below is an interesting flash fiction piece by Christopher Jesse Juarez which uses my photograph entitled, Postal sQuared. Kudos to Christopher! I wish I had known of this piece sooner as I could have championed for it with the editors of the artistic online journal, Two Hawks Quarterly. Moral of the story: Pay tribute to those who create works of art, you never know where it may lead to. 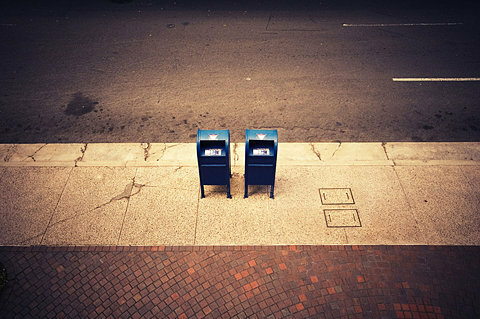 The photo of the two mailboxes was taken sometime in 2008 in downtown Honolulu not far from my home at the time. I used the subject to experiment with cross-processing techniques and stylistic vignetting. It is one of my favorites that has stood the test of time. The photo is also my first published piece which made its debut in the online photo magazine, FILE under the company guise of, analog.roots. The company has since morphed into its current form now known as Soda Pop Jerks after I moved to Los Angeles, sparking a new chapter in the company’s history. In 2010, FILE has since been retired and had a great six year run. Special thanks goes out to FILE founders and creators. Andy and Rick Alfaro for giving me the push to continue forward with photography.